Whew, what a whirlwind it has been since school started last week. Our oldest is in kindergarten, so we now have three at home. 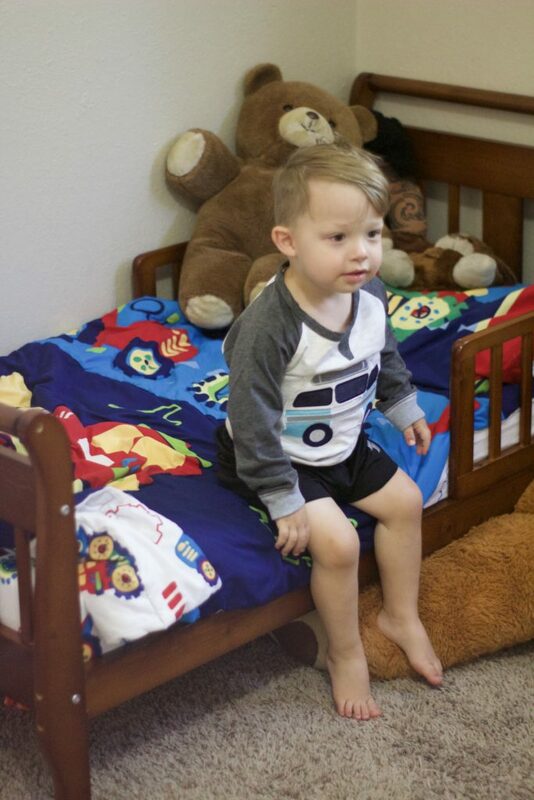 We decided that since everyone around our house is growing and changing so quickly, it was about time to transition our twins into toddler beds. They have been in their own room for about two months now, and I wanted to share some tips for transitioning from crib to toddler bed, for all of you mammas out there that are in the middle of this season too. When I transitioned our older girls, they were pretty much transitioned from their cribs into a room together, at least our middle daughter was. Our oldest co-slept forever (I know… for shame), and it was a little bit more difficult to transition her into her own bed. She still crawls into ours some nights. The twins are sharing a room for now, so the transition was a little bit different (and somewhat easier) because they have been together for their entire lives, and separating them now didn’t seem like a great option. There are a lot of things that I have learned through transitioning four kids from the crib… a lot of failures, and a lot of great tips to share with you all. *Some of the items in this post were sent to me in exchange for my honest review. All opinions of the product and the company are my own. Pick out fun bedding. If they are going to have their own “big kid” beds, then they need big kid bedding to go with it. We couldn’t have the same for both, because they are two very different children. However, I wanted to be somewhat cohesive in their boy/girl toddler room. 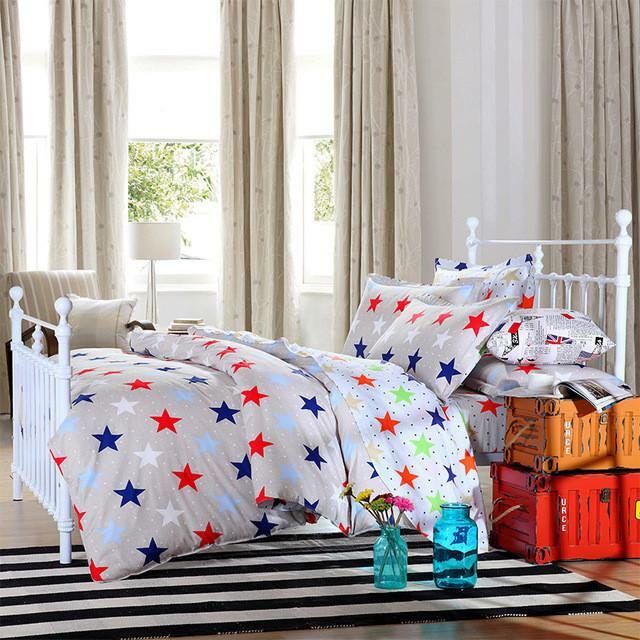 I love this bedding: Everything Kids Toddler Bedding Set, Under Construction from Amazon and this Stars and Dots bedding from Mackenzies Playhouse and I think it looks so cute with the rest of the spaces. Their room is colorful and fun, and although we still need to get a few more things (like I said, they have only been in there for a short time), it works really well and the bedding just ties it in. Give them a nightlight if they need one (even if it’s only for a night or two). Our twins have never needed any type of nightlight, because they never slept with one as babies either. Our older girls still like to have a light on of some kind because they have ALWAYS had a night-light. A mom lesson I learned after two kids was to have this under raps before the toddler years, or they will forever be afraid of the dark. We use this one from KinderGlo. Establish a nightly routine. Our routines are pretty consistent throughout the week. I am a creature of habit, and really need to have an established routine for my family in order to keep my sanity. For our nighttime routine, we have bath time and teeth brushing, then the twins go into their beds. They get prayers and a song from mommy and daddy, each of us spending a few minutes with each twin individually, before we say goodnight to them and close the door. Make their room a place that they want to be in. I have had so much fun decorating our twins room. They are obviously not the same gender, so I had to make it cohesive for both of them. I love how it turned out! With the bedding mentioned above, I stayed with the theme of bright colors with navy blue all throughout. These shelving units from Mackenzie’s Playhouse are perfect for little trinkets and photos, as well as their lamb nightlight that I mentioned above. 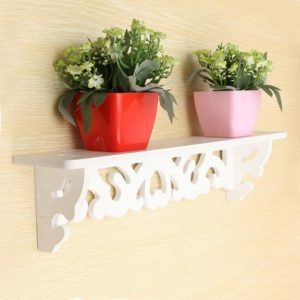 They have a ton of other cute things on their site as well for room decor and outfit options. You can head over to my Instagram to see some of the adorable outfits that they have on their site (like this little sweater!). Do you have a little one moving up from the crib? 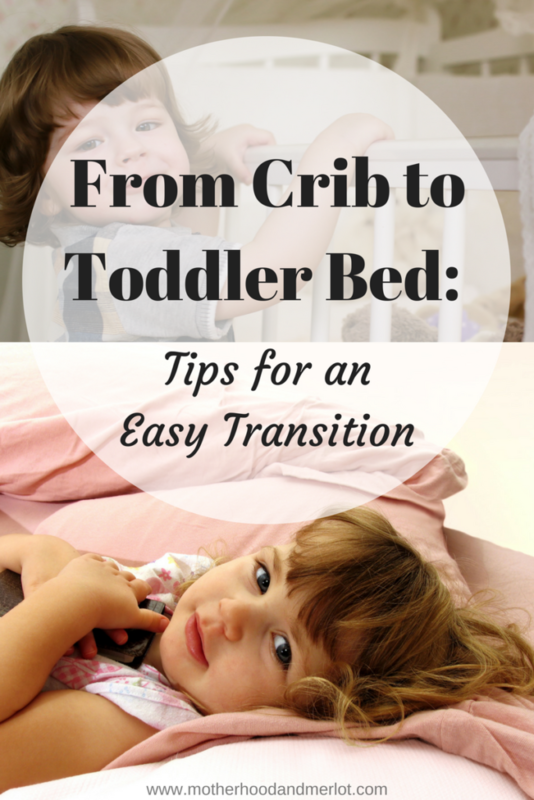 What are some tips for transitioning from crib to toddler bed that you have found work the best? I am going to be ready for this stage before I know it! My little guy is only two months old, but time is flying so fast. Thanks for the tips! We are going to be moving the twins soon, they just have cribs though so will be going into twin beds! Such little guys in such a big bed! Thanks for the tips! Great tips! Routine is definitely key! We are a month or so from transitioning mine I think. I don’t want to do it b/c I know she will be up and running around the room like a crazy person! Great post. My toddler still sleeps in her crib but I suspect that pretty soon we will be transitioning her to her own bed. I appreciate all the tips and tricks. She will love picking out her own bedding and decorating her room—what a treat for her. I have to admit, I’m excited for her, but I am dreading giving her easy access to us all night long. We’ll see how that goes : ) We haven’t decided if we’ll get her a floor bed or a bed that’s slightly off the ground. Do you have a recommendation?